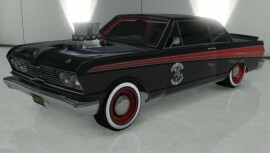 The Vapid Blade is a two-door muscle car featured in the I’m Not a Hipster Update for GTA 5. 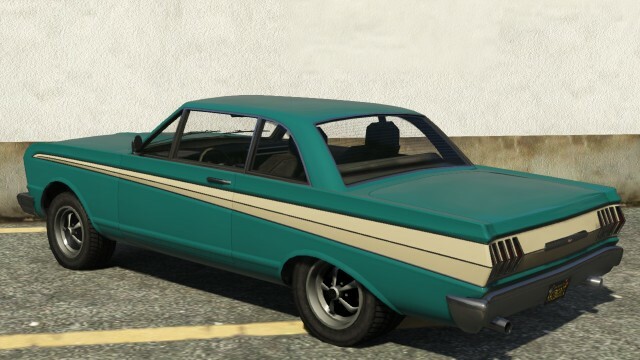 The Vapid Blade is heavily based on 1964 Ford Falcon, the rear bumper is similar to the Ford Fairlane while the double headlights and grille are derived from the Pontiac Tempest, or from the Mercury Comet. The taillights resemble those on the 71-72 Dodge Dart Demon. The nose-high stance of the Vapid Blade is a tribute to the ‘Gasser’ class of dragsters of the ’40s-’50’s-60s, which was the forerunner of today’s ‘Funny Car’ class. While odd-looking today, the Gasser stance came about when racers, trying to lighten their cars, removed the independant front suspension of sedans and replaced it with a simpler, lighter beam axle from a pickup truck. The solid beam axle had to pass underneath the engine, which raised the front end of the car. 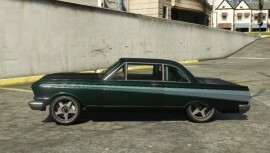 To give credit to the amount of detail Rockstar puts into its GTA vehicle designs, you’ll actually see the beam axle if you look underneath the Vapid Blade‘s front end. 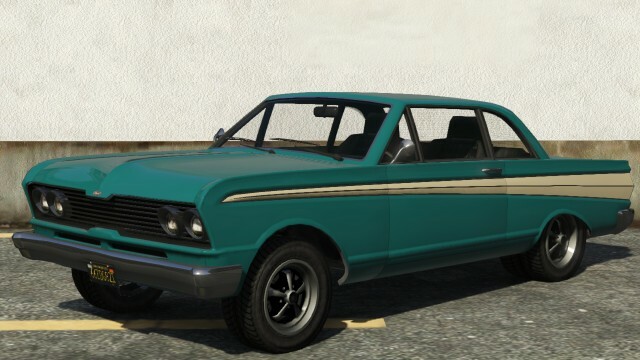 The Vapid Blade is in the ‘Muscle’ class of vehicles. It comes stock with extra-wide rear tires. The Blade has 18 different mod categories. Among the more interesting mods are the ‘Gasser’ hood which features 8 velocity stacks, and the ‘Drag Wing’ rear spoiler which improves Traction slightly. 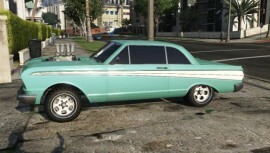 The Blade seems to have the same Roll Cage and Chassis Upgrade setup as the Declasse Sabre Turbo. 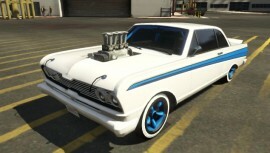 In GTA 5, The Vapid Blade‘s performance is good, it is powered by the high output V8 Engine under the hood. Its acceleration is very good and it can come to a complete stop a second after pressing the brake trigger. 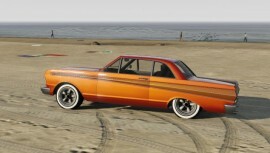 The Vapid Blade has great traction thanks to the fat wheels. 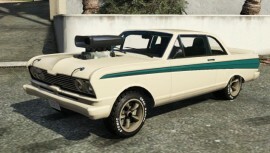 It can also run over bits of cardboard in the Los Santos Storm Drain without wiping out and has excellent durability. Due to the flat rear end, rams to the back by the police cars only result in a small loss of control. One major downside to the car, however, is its terrible understeer. In addition, it has the lowest top speed of all muscle cars, at a top speed of 233 km/h. Brakes, Bumpers, Exhaust, Grille, Hood, Roll Cage, Spoiler, Suspension, etc. Appears inside the garages of any of the protagonists (PS3/Xbox 360). 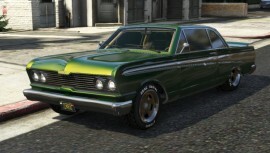 Tends to spawn in car parks located in Pillbox Hill, Rockford Hills and La Puerta, and is commonly found in a lime green color. Spawns outside Los Santos Customs in Burton, usually heavily modified. Can spawn in traffic (PS4/Xbox One). Can appear in Stock Car Races (Enhanced version only). 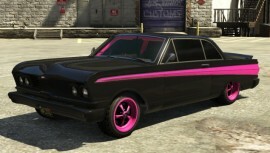 The Vapid Blade can be purchased from Southernsanandreassuperautos.com for $160,000 in GTA Online.